Every broker dealer is required to establish, maintain and enforce Written Supervisory Procedures that are designed to ensure compliance with all applicable regulatory rules and regulations. Thornton & Associates, LLC prides itself on its customized Written Supervisory Procedures. Our procedures are continuously reviewed by the SEC, FINRA and state regulatory agencies and are updated to reflect changes in rules and regulations. With all of the changes in the regulatory industry and the consolidation of the NYSE and NASD rule books, maybe it’s time to let Thornton & Associates’ team of former NASD/FINRA examiners either review and update your supervisory procedures or create a new customized version. For more information about our Written Supervisory Procedures and other compliance services, please contact us at (877) 542-6759. Let our expert compliance team assist you in ensuring that your firm is compliant with all of its money laundering and other compliance obligations. For more information about our Anti-Money Laundering services and other compliance solutions, please contact us at (877) 542-6759. Prepare the FINRA Entitlement applications for the IARD/Web CRD accounts, which are required to file an application to register as an investment adviser and investment adviser representative. Prepare and submit the Form ADV Part IA, Part IB, Part II, Schedule A, Schedule B, Schedule C, Schedule D and Schedule F that is customized to your firm’s unique business model. Prepare and submit the Form U4 (via Web CRD system) to register each IAR applicant of the firm. Verify Form U4 disclosures are consistent with Form ADV disclosures. Advise your firm as to the states that IAR will need to register at the time the firm is initially registered. Prepare and provide your firm with a comprehensive and customized written supervisory procedure manual addressing all areas of your firm’s business. Unlike most consulting firms, you will be provided with a copy of your WSP in an editable Word version so that your firm may make any necessary changes as your firm grows. All of our RIA clients will receive a comprehensive Code of Ethics in a Word format. Advise your firm as to those states which would require notice filing (at the time that firm submits its initial federal filing). Prepare the applications for state notice filings via the IARD system. Every RIA is required to establish, maintain and enforce Written Supervisory Procedures that are designed to ensure compliance with all applicable regulatory rules and regulations. Thornton & Associates, LLC prides itself on its customized Written Supervisory Procedures. Our procedures are continuously reviewed by the SEC and state regulatory agencies and are updated to reflect changes in rules and regulations. SEC Rule 206(4)-7 requires annual testing and onsite evaluation of the adequacy of the registered investment adviser policies and procedures and the effectiveness of their implementation. Our professionals have in-depth expertise regarding investment advisory regulatory requirements and broad experience in the investment adviser industry. When you use our consulting services you will be assured that you have a compliance partner dedicated to meeting your compliance needs and keeping you in legal compliance with investment advisory regulatory requirements. Having a seasoned Financial and Operations Principal is essential to running a compliant broker dealer. Our staff is comprised of Series 27/28 licensed professionals with decades of financial and regulatory experience. Our consultants can register as your FinOp or file your FOCUS and SSOI filings on your firm’s behalf. We are proud of our staff’s accuracy and wealth of accounting and regulatory knowledge. For more information about our FinOp services, please contact us at (877) 542-6759. FINRA Rule 3310 requires every broker dealer to conduct an independent Anti Money Laundering Audit. Our staff of highly trained consultants can perform your AML audit and provide your firm with a professional written report identifying areas of compliance weakness, as well as suggestions on how to improve your internal compliance systems. For more information about our AML audit services, please contact us at (877) 542-6759. Thornton & Associates, LLC can customize a Comprehensive Compliance Package to assist your Compliance Department in meeting your regulatory obligations. Below is a list of services that can be included in your Compliance Package. Please contact us at (877) 542-6759 for more information about our Comprehensive Compliance Packages. Complete the annual Business Continuity Plan review. Update the firm’s OSJ and branch office audit program. Thornton & Associates, LLC is a proud partner of Alliance Worldwide Investigative Group. Alliance Worldwide Investigative Group is an industry expert on FINRA Rule 3110(e): This background check rule was approved by the U.S. Securities and Exchange Commission and took effect on July 1, 2015. Headquartered in Clifton Park, New York, Alliance Worldwide Investigative Group is a fully licensed, bonded and insured corporate investigative service firm. Alliance accommodates the needs of many industries focusing on assisting human resource, risk management, and legal professionals mitigate losses and make informed decisions. Rule 3110(e) requires the verification process be completed within 30 days of a broker’s Uniform Application for Securities Industry Registration or Transfer (Form U4) being filed. If possible, FINRA encourages firms to complete the new background check rule prior to the U4 filing. We are experts at conducting the mandatory search of “reasonable available public records” and if necessary, more in-depth searches depending on the applicant’s job function, responsibilities or position at the firm. Alliance Worldwide Investigative Group takes the burden off FINRA member broker dealers and registered investment advisors by alleviating the time-consuming nature of sifting through records and navigating the new regulations. Our background investigation verifications are conducted in accordance with all applicable laws, rules and regulations, including federal and state requirements, making sure all necessary approvals, consents and authorizations are obtained. For more information about our 3120/3130 compliance services, please contact us at (877) 542-6759. Thornton & Associates, LLC can develop an internal Rule 3110 audit program for you or we can come to your firm and conduct the audit in person. Our firm continually works with our clients during their FINRA, state and SEC audits and knows their audit processes, sampling, and current “hot topics.” During the Rule 3110 audit process, Thornton & Associates can help your firm identify regulatory exposures during your Rule 3110 internal review. Thornton & Associates, LLC has partnered with QuestCE to create the Thornton & Associates Continuing Education Portal. Through this portal we offer the complete QuestCE online continuing education and anti-money laundering training curriculum . For over twenty-five years, Quest CE has been the premier provider of compliance training and tracking solutions to the financial services industry. QuestCE services more than 1,000 leading insurance carriers, broker-dealers, banks, and other financial institutions. For more information about our Online Continuing Education Portal, please contact us at (877) 542-6759. Many firms sell boilerplate procedures or only provide them in an uneditable format. All of our procedures are customized and identify who is responsible for each procedure, how often each review is conducted, specifically how each review is performed and how each procedure is evidenced. Each of our clients is provided their complete Written Supervisory Procedures in Microsoft Word so that they can be edited at any time. For more information about our Written Supervisory Procedures services, please contact us at (877) 542-6759. Every Broker Dealer is required to conduct an Annual Compliance Meeting. If you would like a Thornton & Associates, LLC consultant to participate or moderate your Annual Compliance Meeting, please contact us at (877) 542-6759. Expanding your firm’s operations may mean that your firm is required to register in other state jurisdictions. Each state has its own unique registration approval process. Thornton & Associates’ staff have completed hundreds of state registrations and understand the idiosyncrasies of each states registration process. For assistance in state registrations, please contact us at (877) 542-6759. The FINRA New Member Process can be a complex and arduous process requiring professional assistance. Thornton & Associates, LLC are experts in broker dealer applications. Our firm worked directly with FINRA in developing the current New Member Application process that was launched in the beginning of 2008. Our consultants have assisted dozens of new FINRA applicants through the application process. Our staff will work with your firm and take your firm through the entire approval process in a professional and efficient manner. We are convinced that Thornton & Associates is the most efficient and cost effective solution to your New Membership Application needs. Description of the communications and operational systems. We will compile and prepare all the required documentation for the New Membership Application in a professional portfolio and submit it to FINRA. Additionally, we will quickly respond to any request from FINRA for additional information or clarification of material submitted. We are convinced that Thornton & Associates is the most efficient and cost effective solution to your New Membership Application needs. Should I buy a “Shell BD” or File a New Member Application? Time – The amount of time it takes to get a Continuance in Membership Application (“CMA”) (Change in Ownership) application approved as opposed to a New Member Application (“NMA”). Cost – Application, acquisition, transaction and consultant costs. Conducting Business During Application – Can we conduct business during the application process? In order to understand the differences between acquiring a Broker Dealer and starting from scratch, it is important to understand the terms and acronyms associated with these processes. This is an application for either a new entity or an established entity that has not previously engaged in a securities business to become a FINRA member Broker Dealer or (“BD”). Any material change in the BD’s operations. Any other restrictions on the firm’s business operations that FINRA deems appropriate. 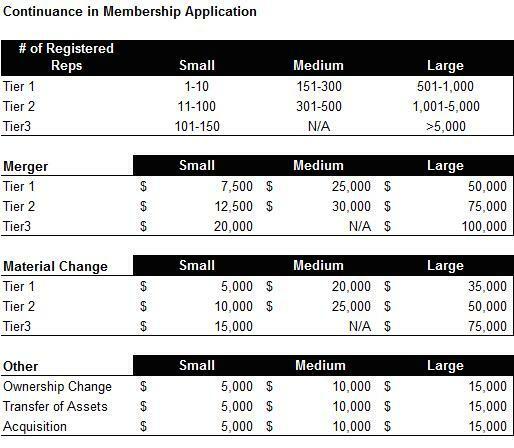 Any changes in the agreement may require a Continuance in Membership Application or a CMA. The maximum amount of time an NMA or a CMA is permitted to take is 180 days from when an application is submitted. Once FINRA receives any application they have 30 days to review it. FINRA will then send the applicant a letter requesting additional documentation or information. Once the applicant receives FINRA’s response, they in turn have 30 days to respond. This back and forth will continue until the application (NMA or CMA) is approved. There are several variables to consider when an applicant is deciding whether or not to buy an existing BD or to start from scratch. Conduct due diligence of the broker dealer’s BD and its prior business. It is important to note that anyone who is purchasing a BD must be VERY wary of anyone who claims to have a “shell” or a “clean” BD. The truth is that FINRA does not permit its members to exist in a “shell” state. FINRA requires all BD’s to report their financial and P&L information at least quarterly. If FINRA discovers that a FINRA BD is not reporting any income or expenses over an extended period of time, they will open an investigation and will ultimately force the BD to shut down due to a lack of business. Finally, it is up to the buyer to determine what is or isn’t a “clean” BD and not the seller. Purchasers must conduct thorough and complete due diligence on any BD they purchase. Many purchasers of BDs are sold on the concept that they are buying a “clean” BD or that the seller will indemnify the new owners if there are any customer complaints or litigation that arise subsequent to the purchase. Purchasers must remember that the indemnification is only as good as your ability to collect. Prepare and submit an application. In most instances, it is easier and takes less time to start a new BD than to purchase an existing entity and conduct due diligence. Most people believe that once the application is submitted, that a CMA takes far less time that an NMA to get regulatory approval. The truthfulness of that must be determined on a case by case basis. The broker dealer must currently be approved by FINRA to conduct the business that the purchaser wants to engage in. If the purchaser wishes to engage in business that is not currently permitted under the BD’s current Membership Agreement, then the purchaser must wait until the application is approved before engaging in that business. Even if the BD is approved for the product lines that the purchaser wishes to engage in, the purchaser still may not be able to engage in that business during the application process. If the business is materially different in the method of solicitation, execution, reporting or a material increase in the existing volume, then FINRA may require that the purchaser wait until the application is approved prior to engaging in the business. The purchaser must also demonstrate that they have the experience, appropriate number of supervisors, policies and procedures, books and records and the operational bandwidth to engage in the proposed business. Under this standard, a “Shell” or an inactive BD would not be able to conduct business until the application is approved because the new business would be materially different from the BD’s existing business. The existing BD must have the ability to register all of the reps that the purchaser would like to bring on board. FINRA sets limits on the number of “Associated” persons that each BD may bring on board under the firm’s Membership Agreement. Although there are provisions in the FINRA rules that permit the firm to add “Associated” person above the limits in the Membership Agreement, there are very specific conditions and standards that the firm must met to be eligible for this exemption. Many firms have found it useful to temporarily register with another BD while going through the application process. This is perfectly acceptable by FINRA as long as all parties understand and that the registered personnel are either starting a BD or acquiring a BD. There are however some issues with this as well. All engagement agreements must be signed by the firm that reps are registered with. Should the reps want to move to their new firm, all engagements must be assigned to the new BD. This sometimes creates conflicts with the prior BD and with the customer. The old BD must maintain all of the books and records of the transaction during the time that the reps were registered with the firm. The prior BD also will retain some carryover liability for the transaction even after the transaction is assigned to the new BD. The decision as to whether or not to purchase a BD and go through the CMA process or to start a BD from scratch is a complicated one. Should you have any additional questions, please contact us at (877) 542-6759. Whether you are starting a new broker dealer or purchasing an existing entity, FINRA will assess an application fee. The fees are outlined below. * These fees are exclusively the one time application fee charged by FINRA filing a New Member Application. These fees do not include any other fees and charges associated with a New Member Application for registering individual brokers, state registration fees, FINRA exam fees, or any other fees and assessments associated with the application. These fees also do not include any consulting or advisory fees charges by Thornton & Associates.